These are our Pricing Guidelines for common furniture items with ranges from Low to High and Average ..As with our other services we require 50% down and 50% completion. Remember that what is done at each phase is important and don’t compare apples and oranges. Ask! These Quick Quotes attempt to help you understand the level of pricing required. They apply to 80% of the typical, average, nothing unusual situations. Your requirements may be in the other 20%. Prices shown are therefore for the “typical item” and not the unusual. We simply must be able to inspect your actual item and discuss with you the options and pricing components for each aspect of what needs to be performed. WOOD REPAIRS are not quoted until inspected. All repairs are quoted separately. Larger, more complex items may cost more. Smaller or simpler items may cost less. Multiples of same item may save per item. The condition/type of the finish being removed is a major cost factor. We are assuming no paint, polyurethane or polyester, for now. The type/color/darkness/matching of the new finish is a major cost factor. We are assuming normal colors, darkness and sheens with no special requirements. COLOR MATCHING will tend to require pricing in the High Range. Pick-up or delivery available but quoted separately. Most Stripping & Refinishing services completed within 6-8 weeks, some up to 10-12 weeks. If you are from the Richmond area & have a digital camera, why don’t you submit a bid request? Take a picture from the front also showing a side, then take a picture from the back also showing the other side. Take a close up of any details or repairs needed. It is that simple. Email them to us using the form on our Contact Us page and be sure to include your city, state and zip. For Easy Payment We Accept via PayPal: When your order is confirmed we will send you a PayPal Invoice to be sure all is correct. There is literally nothing made of wood that we can not finish or refinish, and there is no finish goal that we can not achieve. Bring us the item, a sample or photos of item. There are many finishes and finish damages burn-in, white mark removal, gloss rubouts, power polishing, cleaning, waxing and so on. All finish repairs, however, tend to not result in 100% perfection like a new finish. STRIPPING: Our system involves several steps ALL of which are hand worked by our techs. NO DIPPING or Automated systems are used on your heirloom! Hardware is removed and bagged. With refinishing it is cleaned and clear coated. Selected items are partially disassembled for proper stripping, to include removing backs, doors, etc. If a dining table, the slide system is removed for safe handling. All surfaces are chemically stripped of the existing finish and stain to degree wood allows, using the flow-over system that does not damage wood, veneer, or glue. All surfaces are power water rinsed to remove finish and stripper residue and to neutralize the chemicals. Item is put in an enclosed room with exhaust fan for 3 days of air-drying. STANDARD FINISHES of original varnish or lacquer are stripped using methylene chloride chemicals. 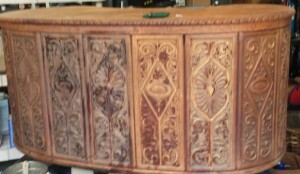 Original varnish or lacquer and stain remove fully. Dye stains remove irregularly. SPECIAL FINISHES of polyurethane, oil paint, latex paint, catalyzed finishes remove irregularly and to varying degrees. Initially they are stripped with surcharges as a “level of effort” that should end in good results, but can’t be guaranteed. IF additional work might be required, the client should decide after inspecting the first round results. Additional charges may apply. FINISHING: We sand for raised grain, stain, spray lacquer seal, scuff, faux treat blemishes, and spray final acrylic lacquer top-coats usually to satin sheen. Scratches, gouges, dents will improve but not disappear. Includes final reassembly and fitting. Hardware is cleaned and clear coated. Using STANDARD STAINS our stripping and refinishing usually runs 3 to 5 times the cost to Strip Only depending on the item.